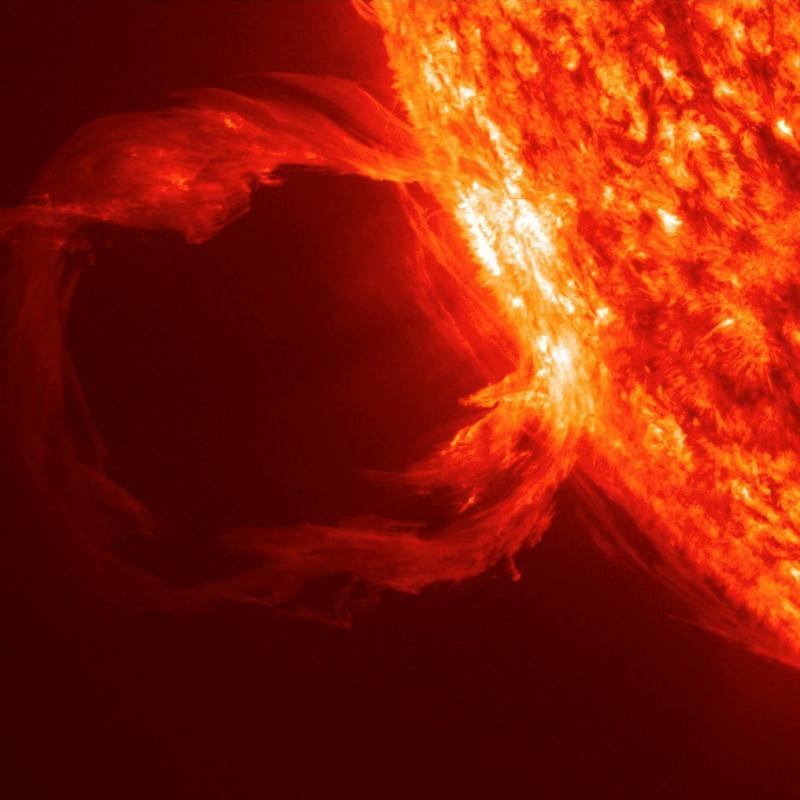 Exactly what is a solar flare and how does it affect us? A solar flare is a magnetic storm on the Sun which appears to be a very bright spot and a gaseous surface eruption, such as in the photograph (left). Solar flares release huge amounts of high-energy particles and gases [plasma] that are tremendously hot. They are ejected thousands of miles from the surface of the Sun. According to Mitch Battros - Earth Changes Media, “One of the best known prophecies/predictions of our Mayan elders is the message of a changing paradigm of our era. In the words of the Maya, it is said that we are now in a time of 'change and conflict'. The change is coming from the ‘outside' in the way of weather, natural phenomena, celestial disturbance (sun flares) and man-made self-inflicted trauma. A recent study published in the New Scientist indicates a direct connection between the Sun’s solar storms and human biological effect. The conduit which facilitates the charged particles from the Sun to human disturbance is the very same conduit which steers Earth’s weather through the magnetic field on Earth, and also through the magnetic fields around humans. Geomagnetic storms cause earth changing events in the way of earthquakes, volcanic eruptions, hurricanes, tornadoes and wind storms. Solar activity is known to influence human consciousness. Do you have any of the above lately? The solar flares and photon waves are changing the fabric of our physical reality as they have a powerful effect on our physical cellular level, causing our cellular memories to awaken and clear. Our lower emotions are low frequency energy stored in our cells from past experiences and traumas that we have encountered and never processed - so they become stored as cellular memories. Photon energy is a much higher frequency energy that pulls up the lower emotional frequency so it can calibrate to the higher frequency... thus we find ourselves releasing these lower emotions of sadness and grief without knowing why. These spells will last for about twenty minutes and we are left wondering where these feelings came from out of the blue. The elements of our blueprint are interfaced in the cellular consciousness and when the blueprint is amplified through photon energies various elements of the blueprint leak into your consciousness and we begin to remember our soul’s purpose. We are pulled to make changes in our life but we don’t really realize why. An interesting fact about this energy is that since it is of a higher frequency it creates the power of instant manifestation of our thoughts, which means whatever we think, we create instantly. This has never before happened in our lifetime [previously there was a delay between thought and its manifestation - Messenger] and that is why many people are writing books on the subject of the Power of Attraction. Photonic energy connects to our thoughts so it is important that we know what we want, rather than what we don’t want, otherwise we will manifest more of what we don’t want. If you are in the process of change and transformation this energy works well for you. On the other hand, if you are stuck in the past through victimization and anger, you will simply manifest more reasons to remain stuck in victimization until you are ready to release it. Note: The ancient texts tell us to look to the skies as they would create the catalyst that would bring about change on Earth at this time. Many people are feeling agitated and uneasy recently. The solar flares can break apart old patterns that are no longer needed so new ones can emerge. This can make us feel hyper and exhausted all at the same time. It can also wreak havoc with technology such as computers. Time and space are beginning to wobble even more erratically than before. We seem to be losing track of time easily. We lose words when we are speaking. We are not sleeping very well... again. There is lots of tossing and turning in the night and many are having unusual dreams. We are feeling huge power surges in the body followed by energy drops. There are many reports of nausea, body aches and pains and dizziness. Some feel like they are walking on water (ie ungrounded). Others say that when they close their eyes at night everything is spinning. Are you experiencing any of this? This isn't anything to be afraid of... just be aware of what it is and get extra rest and drink lots of water. Earth is a sea of vibrations and frequencies. Mankind is skilled in creating and inventing devices in which there is an energy frequency and vibration. These waves of energy are always moving through you. Imagine for a moment all the electrical devices in just your home alone - every light and lamp, the phone systems, all the kitchen appliances. Each device gives off a certain frequency. The television is one of the major contributors of discordant frequencies. Most people are not aware of these frequencies. They have tuned them out; their energy field has adjusted and learned to live with them. This planet is woven with electronic frequencies. If you had the vision to see the strands of energy connecting all the power lines, electrical devices, cell phones, televisions and microwaves, you would be amazed at how tightly woven this energetic matrix truly is. It surrounds your planet in an energetic grid of discordant frequencies. Most of humanity does not even think about this. There is an attitude of "What you don't see or don't know about, won't affect you." These matrixes of electronic frequencies are always affecting the physical body, the mental state of mind. These electronic frequencies are addictive and hypnotizing to your personal energy field. These man-made electronic frequencies hold a certain mindset in place. Be aware of these discordant frequencies and the matrix that they create. It is important for you and others to stay anchored, stable and firm in your own personal energy field and matrix. You will be less affected by discordant frequencies. The solar flares, the galactic bursts of energy, are surging through this shield of hypnotizing electronic frequencies, activating certain aspects of the DNA codes. These cosmic energy thrusts are a wake up call to humanity. The earth's magnetic field holds the higher integrity of the hologram in place. This is being overridden by the electronic fields. Humanity is receiving the highest support from the consciousness of the cosmos and celestial beings: individuals are waking up to their magnificence, their divine star connection. You create a cohesion field when you maintain a strong energy field of love, joy and appreciation. When you vibrate these high coherent frequencies you will not be affected by the bombardment of the planetary electronic grid. Be in your joy, and swim, flow and stream with the energy from the stars.